HP Smart Array E500 PCI-E x8 SAS RAID-controller kopen? | That's IT! Een low-profile (met Full-Height bracket) PCI-Express x8 SAS RAID adapter met 256MB cachegeheugen. Geschikt voor gebruik in verschillende modellen HP Proliant servers. The HP Smart Array E500 is HP's external connect only, entry level PCI Express (PCIe) Serial Attached SCSI (SAS) RAID controller. The full size card has 8 ports (2 x4 mini SAS external connectors) and utilizes DDR2-533 memory. The SA-E500 offers RAID 0, 1 and 0+1 and can be upgraded with the battery-backed write cache (BBWC) module for RAID 5. 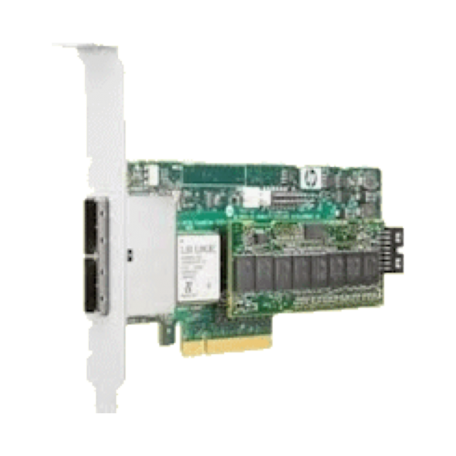 This low-profile card is ideal for customers needing a low-cost external connect for HP ProLiant servers to tape, JBODs, and intelligent Modular Storage Arrays (MSA).